After two years of standout work on the mound for the Gloucester Catholic High School baseball team, junior John Murphy was finally the true leader and ace of the Rams pitching staff. He showed it all season long, maybe most importantly in his lowest moment. Murphy posted a 0.70 ERA along with an area-best and career-high 82 strikeouts in 60 1/3 innings, but committed a costly error in the Non-Public South A final that resulted in two runs. He kept his team in the game and gave them a chance to come back and tie the game however, and it’s for the talent and demeanor he provided for the Rams that he’s the Gloucester County-area Baseball Player of the Year. “He was really excited, and you could tell by the way he got after it in preseason,” Gloucester Catholic coach Mike Rucci said. “His demeanor, he just walked around like he knew he was going to be the guy for us. He’s one of the best big-game pitchers in the history of Gloucester Catholic, and he was excited he was going to be the guy. He pitched well enough to win every single game he went on the mound.” Murphy allowed fewer than a baserunner per inning, and gave up four runs, one earned in his two losses. Two of those came on his own miscue in the sectional final, a weak comebacker to the mound that dribbled under his glove. After St. John Vianney capitalized with two-out run-scoring singles, he retired five straight as the Rams rallied to tie the game in the seventh. He wasn’t able to hold it thanks in part to an infield single and the game-winning seeing-eye single to right, but never betrayed his emotions on the mound whether it was his own mistake or that of a teammate. That was especially important early in the year when the Rams defense struggled, and the team committed 43 errors that led to 40 unearned runs on the year. “Since I was little, my dad’s been (drilling) it into me, no emotion on the mound,” said Murphy. “If you stay nice and calm out there, it can only go good. If you start to lose it out there, the other team and the fans are going to catch on (and try to exploit it). You’ve always got to have your teammates’ backs.” As good a year as Murphy had — throwing a five-inning no-hitter against Timber Creek with 12 strikeouts was a highlight — he also credited the job fellow hurlers Steve and Tyler Mondile did to help round out the bulk of the Rams staff. But it was guys who came before him, most notably Maryland freshman Mike Shawaryn, who were also influential in Murphy’s season. “I think it has to do with the fact he saw guys like Shawaryn in practice,” Rucci said. 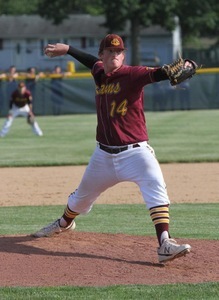 “He was able to pitch a summer with Cody Brown, Casey Brown, maybe one of the best pitching staffs ever (with Brooklawn American Legion), and that experience helped him tremendously and helped him in every area in the game of baseball. He watched them get after it and was able to learn a lot from them.” Already committed to follow Shawaryn to Maryland after next year, for the past two weeks Murphy’s been working to further improve his game — first at a Perfect Game event in Florida and a then a tryout for the national U18 40-man roster in North Carolina. He’s trying to develop a changeup to go with a low-90s fastball and an effective curveball, but even if it’s not ready by next spring Murphy will be to go out and try to put up even better numbers next year in the quest to start a new string of titles for the Rams. “His velocity improved, he got a little more depth on his breaking ball, and his strikeouts really went up this year,” said Rucci. “His legs got stronger too, but his belief in himself and his ability helped make him so dominant. I think bottom line is he’s a confident kid, not a cocky kid. We haven’t seen the best of John Murphy.” “Of course you’ve got to think about (the way the season ended), maybe a week or two after it happens,” Murphy said. “But there’s always tomorrow, I still have another season and we can still start another five-peat. Hopefully the teams after me can keep that going. We’re never going to stop playing Gloucester Catholic baseball, it’ll be the same way forever.